Japan, a fine set of two tall and large scale hand caste bronze finely detailed red crested cranes. Attractive variegated green patina surfaces. Dimensions: Tallest crane 33 inches tall Horizontal crane 21 inches wide Age: Taisho period Provenance: Old Shiga garden Handmade. Hand cast. Beautiful hand cast detail with lovely green patina with realistic web feet- just the way we like to find them. You may install them as a set or individually. Tough patinated bronze resists inclement weather. History of the crane form: Magnificent garden showpieces, cranes in Japanese culture symbolize luck, longevity and fidelity. 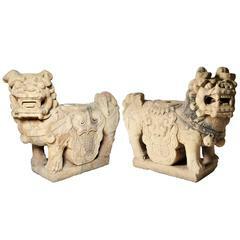 Lifetime guarantee of authenticity: All of our Asian works of art come with our Lifetime Authenticity Guarantee. wo. 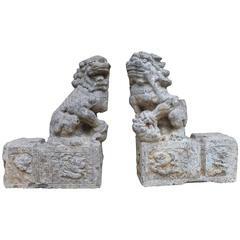 Pair of grey stone carved foo lions with good detail through out sit on top of detail base of dragons, rabbit and floral motif. Provenance: Acquired from Brunk Auctions.